A few Saturdays ago, Bea and I were at the house waiting for Berto to come home. I was actually cooking dinner while trying to fix up the house's mess the best I can. I've never been known for my cleanliness. Hehe.. Anyway, I was just about finished with my cooking when I received a call from the hubby. He said he had a particularly rough day at work. Too many difficult customers he said, and that he just wanted to eat out to relax and take a break. I eagerly agreed, anyway we can just eat the dinner I cooked the next day. After a few minutes, Berto was downstairs to pick up his ladies. 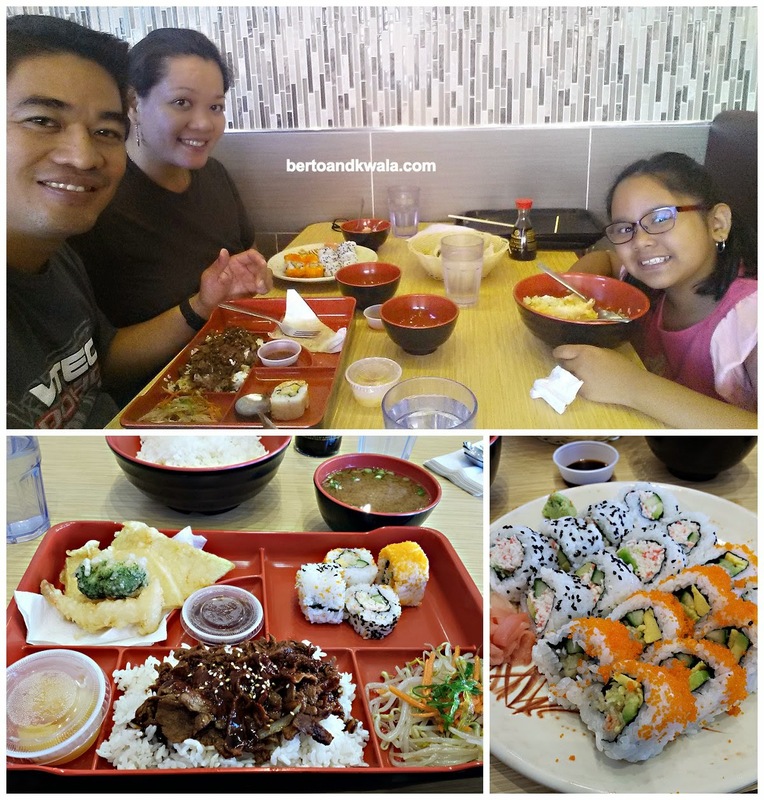 We were craving for some Japanese food so we decided to go to Tokyo Express near the Millwoods Town Center (5220 23 Ave NW Edmonton, AB phone number: 780 468-1668). This restaurant offers Japanese cuisine fast food style. Their menu offered noodles, rice bowls, bento boxes as well as several options from the sushi bar. Bea and I shared a Shrimp Bento Box ($10.99) while hubby ordered a Teriyaki Beef Bento ($9.99). We also ordered a Mini Roll Combo ($7.99) which was composed of 16 pieces of mini California rolls and mini Dynamite rolls. As we were eating, I noticed that the restaurant was quite popular judging by the number of customers that went in to dine or to just order to go. Serving were huge, food was yummy. It was a bit difficult to communicate with the lady at the counter because of her heavy Japanese accent but she was patient with us. We definitely enjoyed the food and dining experience at the Tokyo Express. We'll have to come back again and try other items from the menu.